Finland, my home country, is a land mostly covered with forests and lakes, and in the late summer and autumn those forests are full of berries and mushrooms, so it is not surprising that foraging is deeply embedded in the Finnish genes, and berry picking and mushroom hunting are pretty much a national hobby at the autumn time. Although I have been happily settled here in the UK for a pretty long time, at this time of the year I always miss the Finnish forests and wish I could go there, pick wild berries and enjoy the wind in the trees and the damp mossy smell of an autumn forest. And this year the urge to go foraging is even stronger than usual – I have just had my first go at mushroom dyeing, with the wonderfully named “Surprise Webcap” (Cortinarious semisanguineus, verihelttaseitikki in Finnish) and I managed to get the most beautiful rosy red colour from it. It’s by far my favourite red that I have ever managed create by dyeing so obviously now I just want to go and pick as many of these little mushrooms as I can possibly find. Well unfortunately I can’t do that, at least not this year, but luckily I have a few mushroom agents (=my dad and my sister) scouting in the forests of Finland who have promised to be on the look out for some dyeing mushrooms for me. We are armed with a new mushroom dyeing book – Sienivärjäys by Anna-Karoliina Tetri, which is the first ever Finnish language mushroom dyeing book published (until now Finnish dyers have had to rely on Swedish sources). It’s an excellent book, I would warmly recommend it but I know the Finnish language might be a bit of a barrier for most of you. As with dye plants, there are many mushrooms that will give your various shades of yellow, orange, fawn and brown. Beautiful as those colours are, you can easily get these colours from many plants, so dyers will get mostly excited about the rarer colours of reds, blues and even purples. The blues you get from mushrooms look particularly beautiful, some of them are more greeny blue, others bluey grey, all my favourite colours. But on this occasion, I focused on the colour red as I had bought, from Anna-Karoliina Tetri’s shop, some dried surprise webcap mushrooms. I poured boiling water over the dried mushrooms, added some washing soda to the liquid to help the dye extraction process, a tip from Leena Riihelä of the Riihivilla blog (always a great resource on natural dyeing, and, being a fellow Finn, she writes a lot about mushroom dyeing too). The stems of this mushroom give yellow colour and the cap deep reds, but my dried mushrooms had been dried whole and I didn’t bother separating the stems and the caps so it all went into the same pot. I let them soak properly for about a week, then simmered the pot for an hour, strained away all the bits and then was ready to go. 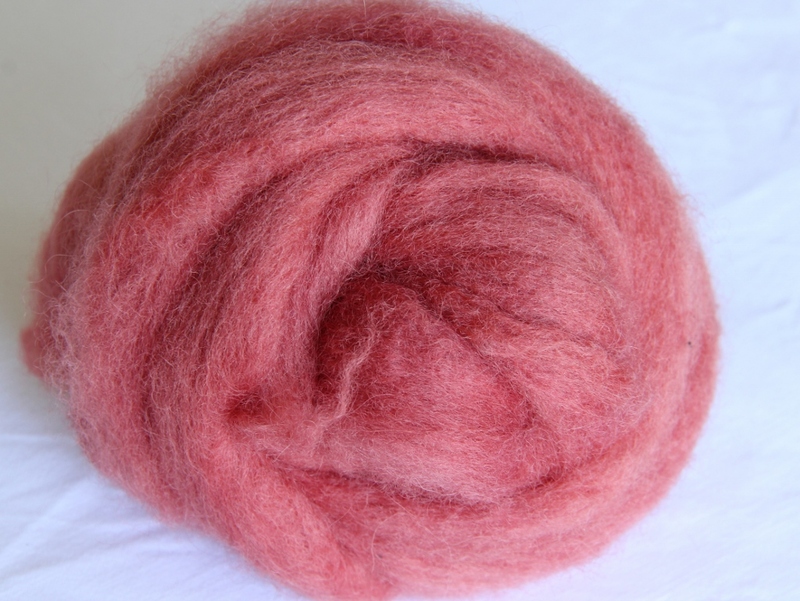 silk didn’t absorb the colour quite as strongly as wool so most of my silk skeins look quite pink. The copper mordanted silk looked more like grey than red. 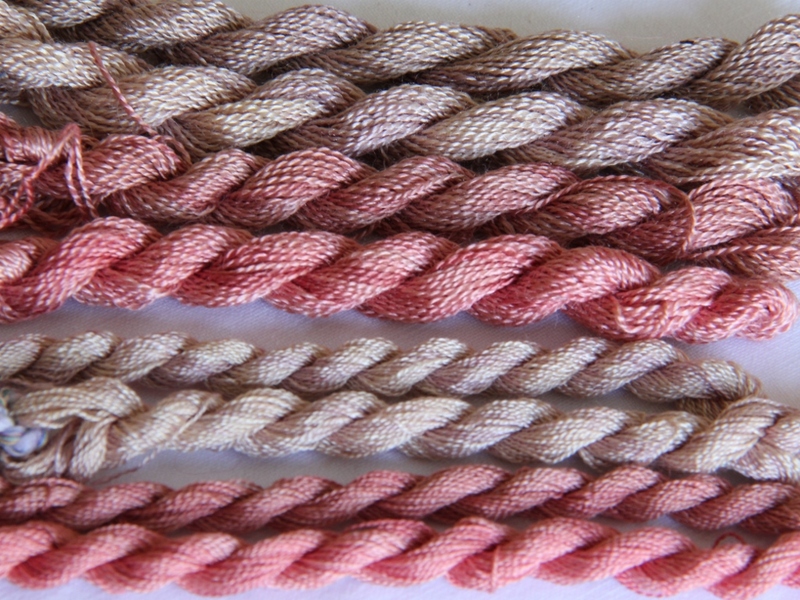 From the bottom: alum, alum+iron, copper, copper+iron and then above these, the same combinations again in a thicker yarn. 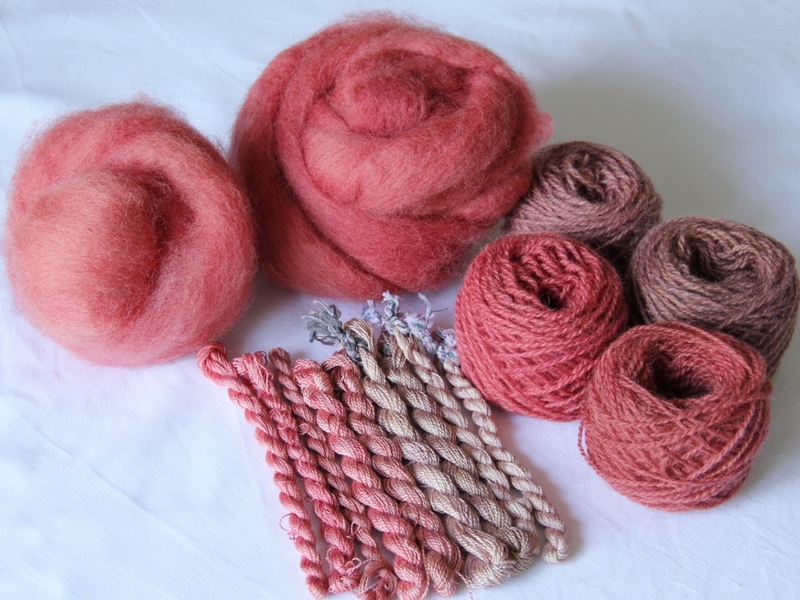 A ratio of 2 parts of dried surprise webcap to 3 parts of alum mordanted wool will give you a nice rosy red with a slightly brownish hint. Acid modification washes out the colour a little bit but an alkaline bath intensifies it. Wool mordanted with copper produced more brown shades with a hint of purple in them. 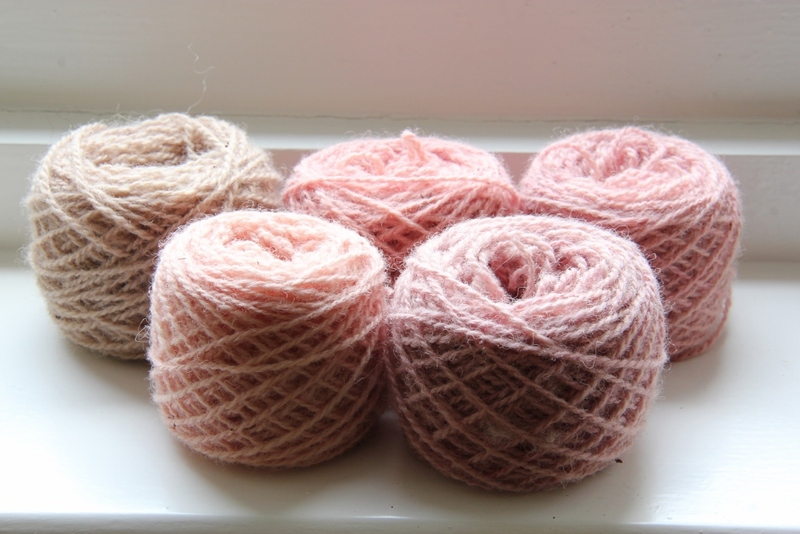 After my first dyeing session I noticed there was a lot of dye left in the pot, so I kept using the exhaust baths over and over again, getting increasingly light peachy pinks until after the 5th go, the yarn was barely off-white and so I declared the dye bath exhausted. 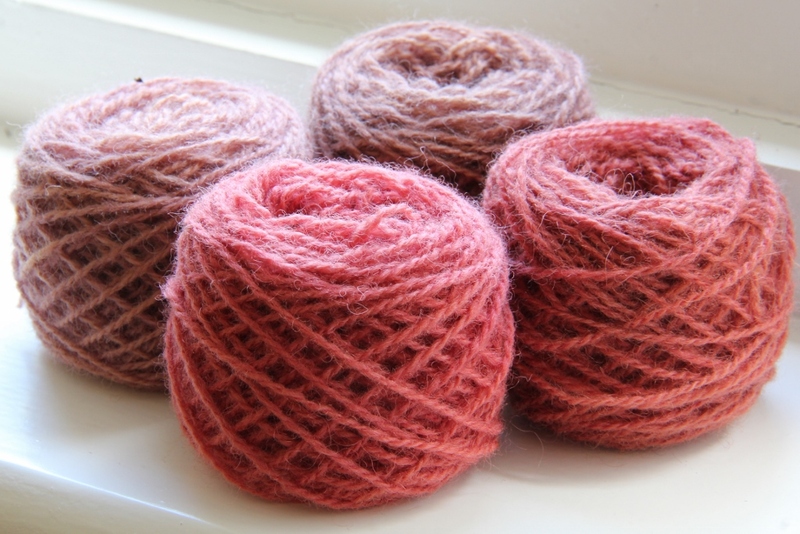 I had simmered my alum and copper mordanted yarns in separate pots to avoid cross-contamination. As I decided not to use any more copper-mordanted wool after the first bath, I chucked some alum-mordanted wool into the pot that had previously been used for copper-mordanted wool. And this was a happy serendipitous thing to do, because I discovered that this way, the reds I produced had a much bluer undertone that the “non-contaminated” alum yarns. I don’t often use copper as a modifier (to reduce the amount of liquids containing copper I am having to find a way to dispose of) but in this case, just by accident, I discovered a nice colour that I may well want to recreate in the future. One thing I will want to try in the future is modifying dark red alum-mordanted wool with copper, just to see what that blue/purple shift from copper would look like on darker red yarn. Luckily, I have one more 50g bag of this mushroom left so I can have another go soon. And, my trusted mushroom agent has already sent an interesting looking parcel containing various little bags of dried dye mushrooms so I will be able to continue my experiments a bit longer. Mushrooms also keep popping up around here at the moment, so I may need to do some research on the dyeing potential of mushrooms growing around here. 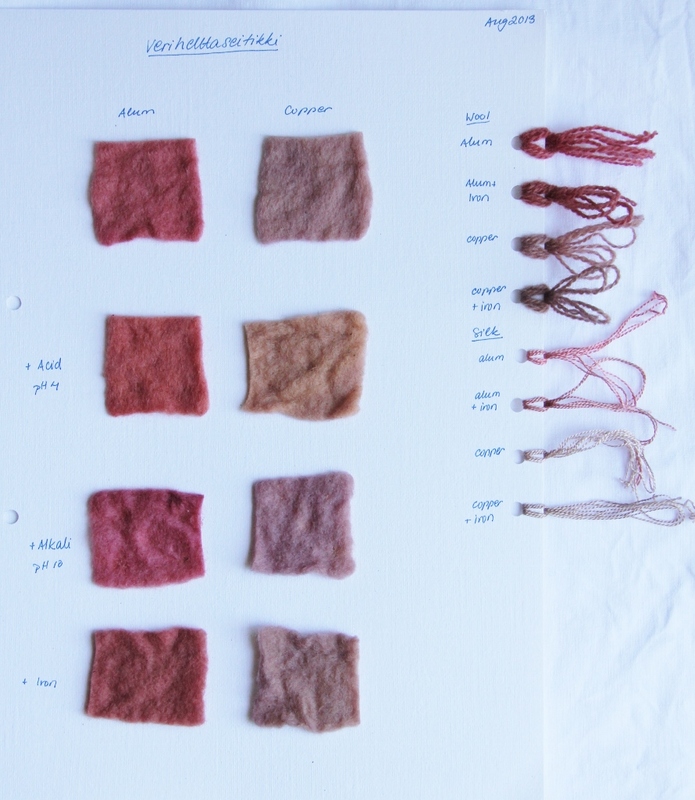 Categories: Colour Files, Dyeing, Red | Tags: cortinarious semisanguineus, mushroom dyeing, natural dyes, naturally dyed red colour, surprise webcap, verihelttaseitikki | Permalink. I love colour wherever I find it, in art, photography, gardens, nature. 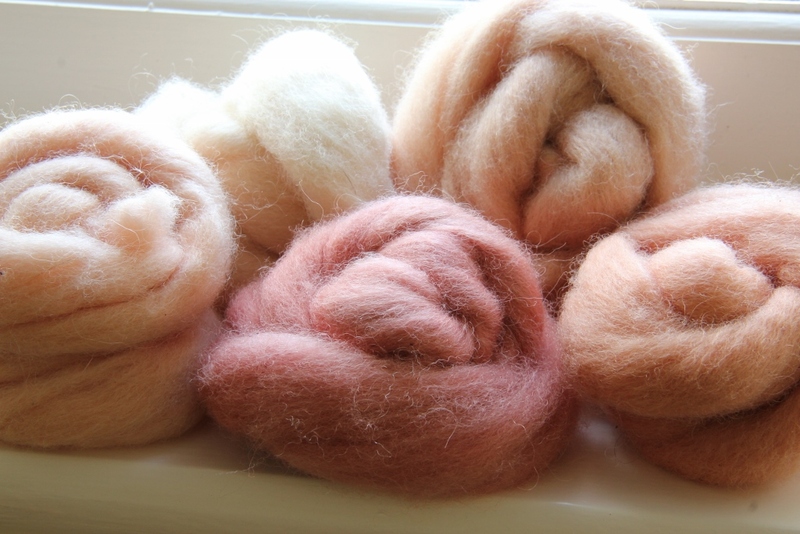 I also love all kinds of fiber arts; spinning, dyeing, knitting, felting, sewing. This article is really surprising one that mushrooms too have stored colors in them. Will these mushrooms ooze more color if used fresh?Please give tips on coloring ready made cotton dresses (shirts, pajama etc). I’ve never used these mushrooms fresh, so I’m afraid I don’t know if they ooze colour as such. From a dyeing point of view the only difference between fresh and dried mushrooms is that fresh mushrooms contain more water, so in terms of weight and volume you need more of them when dyeing, but the drying process doesn’t affect the dye very much. And I’ve never dyed cotton, either as a yarn or in ready made clothes, so unfortunately I don’t have tips to share on that front. The colours you got are so beautiful! Beautiful colors! I find mushroom dyeing so interesting, but am (alas) a poor forager. These are such wonderful colours! ah, that is always the question 🙂 The yarn is going to be a gift to someone, and the rest… well something very small as there isn’t much of it, perhaps a hat or gloves. These reds and peaches are among my favorite colors! Thank you for explaining your process and results, even from “mistakes”. Your projects are all so beautiful. Exceptional info. I would love some photos of the mushrooms to see if I could find some here in Ohio USA.